Visiting Exhibition: "American Beauty & Bounty: The Judith G. & Steaven K. Jones Collection of Nineteenth-Century Painting"
Judith and Steaven Jones began to acquire 19th-century American paintings in the late 1970s. The collection has grown to include 29 works that the Joneses will leave as a bequest to the Crocker. The collection constitutes the most important gift of American art from beyond California’s borders to ever come to the Museum. Many paintings in the collection are by Hudson River School artists, landscape painters centered around New York City who became known for their depictions of the Hudson River Valley and surrounding region, as well as locales farther afield. The collection includes key artists associated with the Hudson River School’s first generation: Asher B. Durand and Thomas Doughty; as well as the second: Albert Bierstadt, Alfred Thompson Bricher, Jasper Cropsey, Sanford Robinson Gifford, William Hart, John Frederick Kensett, William Trost Richards, and Worthington Whittredge. There are also still lifes by George Forster, John Francis, William Harnett, Severin Roesen, and Claude Raguet Hirst, plus genre paintings by Thomas Hicks, Eastman Johnson, Jervis McEntee, and Enoch Wood Perry. Asher Durand, Pastoral Landscape, 1866. Oil on canvas, 18 3/4 x 29 1/16 in. Crocker Art Museum, Judith G. and Steaven K. Jones Collection. Most recently, after deciding that the Crocker should be the ultimate home for these paintings, the Joneses added their first painting by Albert Bierstadt. 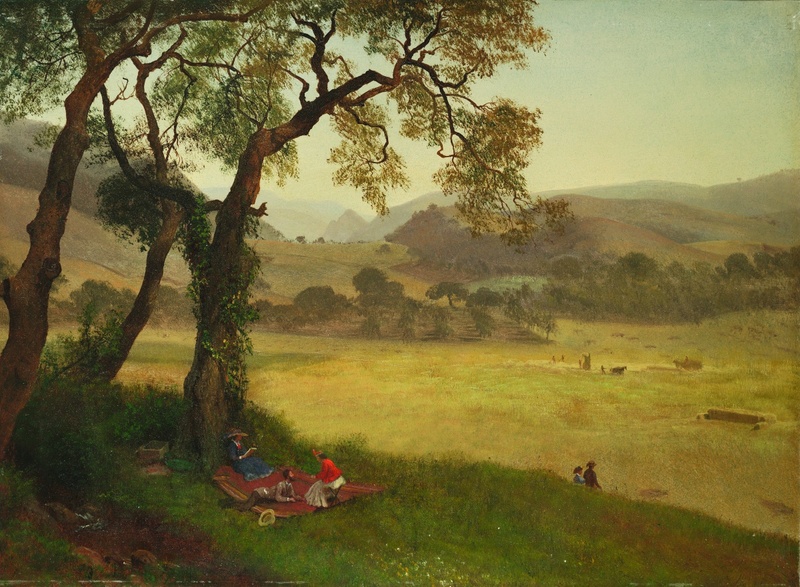 It is a scene of the artist and his family picnicking near Oakland, which provides a thematic link between the Joneses’ East Coast paintings and the Crocker’s California views. Collectively, paintings in the Jones Collection communicate a spirit of American optimism, of transcendental wonderment in nature, of national abundance, and of nostalgia for ways of life that, even as the scenes were being painted, seemed already to be passing. Not only do the paintings celebrate nature with topographical accuracy, they moralize, induce piety, and appeal to viewers’ sense of nationalism by what they include or leave out. Asher B. Durand, for instance, believed that art should be representative, not just imitative, meaning that it needed to “satisfy the mind.” Two landscapes by Durand in the collection manifest his approach. Each is pastoral — the smaller limned in 1857 and the larger in 1866, shortly before and then just after the Civil War. Both include a stream flanked by trees and cows, the latter indicating that this is domesticated land, and that people cannot be far away. In the larger view, there are foreground flowers, possibly a symbol of hope in the wake of the war. Some works in the Jones Collection blur the boundaries between landscape and genre painting; others depict scenes of everyday American life for its own sake. Like Durand, most landscape artists in the first half of the century believed that humanity — or evidence of humanity — could be acceptably included in the landscape so long as it increased the communicative power of the natural scene and did not dominate the painting’s message. As the century wore on, this became increasingly true, as both artists and the public became ever-more interested in domesticated scenes. John Frederick Kensett, School’s Out, 1850. Oil on canvas, 18 x 30 in. Crocker Art Museum, Judith G. and Steaven K. Jones Collection. Severin Roesen, Still Life with Fruit and Wine, 1862. Oil on canvas, 24 x 30 in. Crocker Art Museum, Judith G. and Steaven K. Jones Collection. American Beauty & Bounty: The Judith G. & Steaven K. Jones Collection of Nineteenth-Century Painting is on view at the Crocker from October 28, 2018, to January 27, 2019. Cover image: Albert Bierstadt, A Golden Summer Day near Oakland (detail), c. 1873. Oil on paper on Masonite, 16 9/16 x 22 1/4 in. Crocker Art Museum, Judith G. and Steaven K. Jones Collection.